I drove two hours to see this show. I left early, wanting to beat traffic and ensure I understood the parking situation. 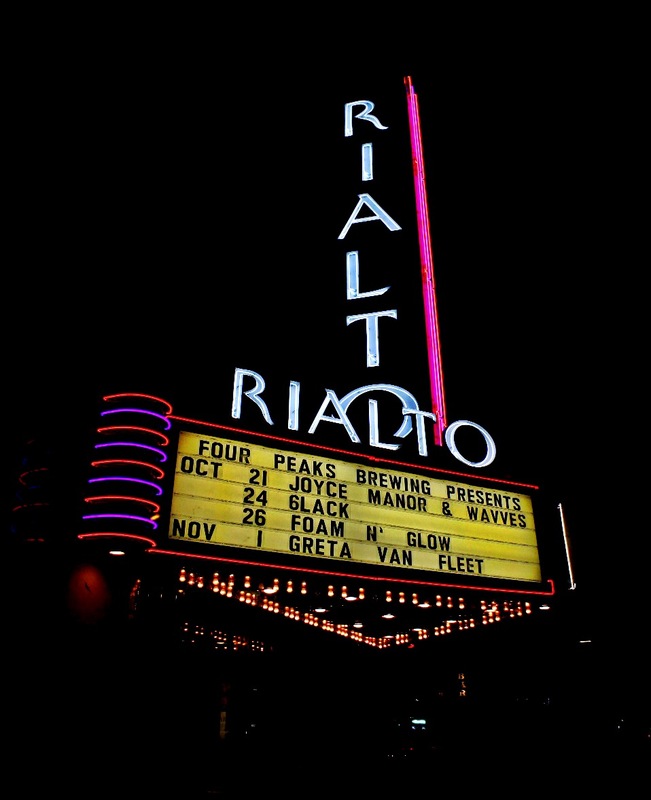 I looked up the venue, Rialto Theatre, and looked through their general reviews and the information they have on their site. At this point I was waiting, minutes, before I would be on that long road to Tucson. Once I reached the venue it was 4:00pm. The doors weren’t open yet. Walking around the building I hear the clashing of drums and faint singing. I walk closer to a black door and I can hear Joyce Manor sound checking. I found a corner and listened to them sound check and play a few songs. I quickly found out I was not the only person who drove from Phoenix to Tucson to see the show. A three-person group walks down the alley way, listening to the same sound check. I call them over and talk to them. They were all excited to see Joyce Manor and couldn’t believe it would be with Wavves. They went off to eat and I toured the city until I sat in line. The city is lively by 6pm, there are cars driving around, religious groups yelling about Jesus, people blasting their music, touring in their nice cars around down town. The traffic and flow are confusing, especially since no one cares about cross walks. While waiting we lined up against the wall. I sat next to two ladies. One girl was in a beanie and very shy. She was excited to see Joyce Manor and we fan freaked over all the surfer punk we could think of. 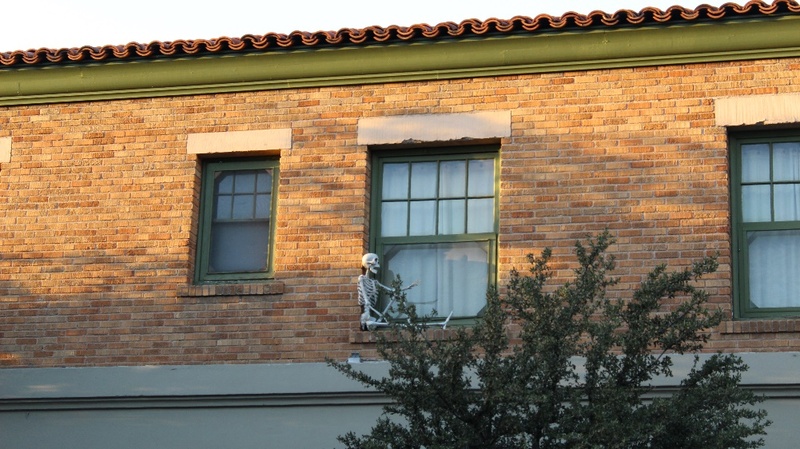 We giggled at the skeletons hanging out on the window at the Hotel Congress, a historical hotel in Tucson. The security team begins to set up and we are getting antsy. After passing the security check I walked into a small red room and purchased some merch. I really enjoyed this venue. The manager was a very sweet man and so was his security team. They let us jump around, mosh pit, and stage dive with no issue. When you pass the red room, you enter the auditorium which is about the size of Marquee Theatre but with overhead seating and roofs that seem like they never end. The light worker for the show deserves a special shout out, even the photos I took on my phone captured the beautiful ambiance of the venue. They had two bars, three servers, so the lines were always small. The first band that went up was a band I have not listened to before. The lead singer, Sally Spit, was rocking a fire red mullet. She had a powerful voice, exemplary stage energy, and was accompanied by Daniel Trautfeild, the saxophone player and their drummer Max Albeck. This band is from Los Angeles, and they are “feminist art-punk”. They were the opening band and you could still see the audience dancing around to the songs. I spoke to a guy who seemed energetic about the band and had never heard of them either. I could see the audience was already comfortable with each other. 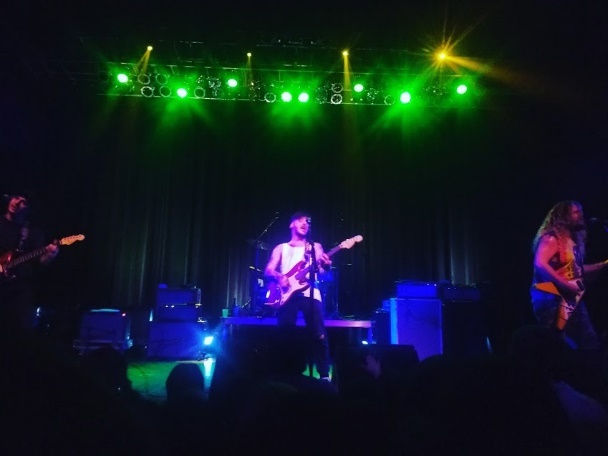 The second band to play was WAVVES, which is a big surfer punk band. 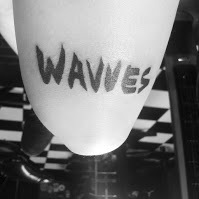 WAVVES was formed by Nathan Williams in San Diego, California. The band also includes Alex Gates, Stephen Pope and Brian Hill. This was the first time I had seen them live but I’ve been a fan for years. I asked a couple people around me including Jack if they have heard of WAVVES. To my surprise they had not heard of them. The second Nathan came on stage the audience shifted back to energetic, excited dancing, with fans screaming the lyrics. I was in the pit at this moment, so was Jack. There is nothing more euphoric and exciting then being around people who love the same thing as you. Nothing more beautiful than a band reaching out to their fans, preforming their art, and honestly letting us in to a personal part of their life. It was amazing to see people who have never listened to WAVVES dancing as a family. The final act was Joyce Manor. 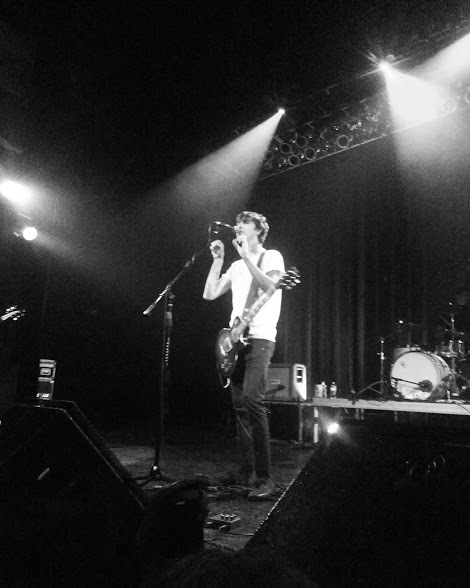 Joyce Manor is a rock/punk band from Torrance, California. It is made up of Barry Johnson, guitarist Chase Knobbe, drummer Jeff Enzor and bassist and back-up vocalist Matt Ebert. Joyce Manors energy and audience energy was much more intense. Everyone was ready, had waited hours, just to see Joyce Manor. Barry enters the stage and the audience goes wild. We love you screams and song titles being yelled out. He begins playing and everyone is jumping, the small pit has turned into the whole floor moving around to the music. A woman grabbed my hands during a song and we shared a moment of singing. Jack helped me up any time I fell and if he wasn’t near me the family had my back. I spoke to Sally Spitz from the first band and I talked to Nathan. I had him sign my leg which I got tattooed by Emily Moreno at Scared Art Tattoo Studio. She did a beautiful job tattooing the band’s name in sharpie style and unique to Nathans handwriting. She is a wonderful conversationalist. Then I headed home with new friend requests and a connection I will never forget.